Most people are aware of the story of David and Goliath and how a pimply faced runt of a kid delivered a nation and became king. What there might not know however is that to win, David faced more than one foe. It started in his own family and he was eventually opposed by Saul. The story of David and Goliath however also reveals that David faced not one giant, but six! The events leading up to and including his confrontation with Goliath himself is seen on the page Goliath, accessed via the button above. This particular story however is about his attitude towards all of these giants and it has a bearing in our lives today. Therefore when that tooth developed problems it took me by surprise. I went to bed one night without any symptoms and woke in the early hours in pain. I later telephoned the dentist and was given a priority booking around midday. He did all the usual tests and probes and was surprised to find decay, but the problem was that it started below the gum line in my lower right second molar tooth. We discussed my options and he recommended a visit to the specialist. On my visit there, I was given bad news. A nerve had died and the hidden decay had infected my gum. The tooth had to come out. I shared that to illustrate that we are not immune from things like that and that there is a spiritual message to be learned as I will share later. I heartily believe in the healing ministry and miracles do happen in my own ministry. I met with one of the leaders of the Argentinian revival back in the ‘70’s who told me how people in one of his meetings started crying out loudly whilst holding their hands to their mouths as fillings popped out of their mouths because God recreated their teeth. God can do it and does do it today, but the point I want to make is not about healing, but about hidden problems and obstacles and how we deal with them before they become major issues. The story of David and Goliath is found in 1 Samuel 17. In the account, David was a runt of a kid and his own family treated him badly. He wasn’t even invited to the meeting when Samuel came to their home searching for the new king of Israel. When Goliath came out to confront God’s people, he was not alone. As we can do in life, we sometimes miss all of a story because we focus on one thing only and not see the things that are hidden. David came out to confront Goliath who was about 9 feet tall. He was a giant. The Old Testament tells us that giants lived on the earth at one time. There are the Anakim, who are descendants from the Nephilim mentioned in Genesis 6:1–4. Some people think that fallen angels or evil spirits fathered those giants. I am not sure of this so will not comment on it, but we shall see some other information later. Moses and Joshua encountered them when leading the Israelites through the wilderness. See Numbers 13:22–33 and Joshua 15:13–14. The land to the east of the Jordan River was heavily populated with tall people known as Emim (Deuteronomy 2:10–11) and the Zamzummim, also called the Zuzim. See Deuteronomy 2:10-11 and 20. The Amorites is another group that stood in the way of Israel claiming the Promised Land and are described as being exceptionally tall. See Amos 2:9–10. Another group were the Rephaim. They are mentioned approximately 20 times, mostly in association with the conquest of the Promised Land. Moses encountered King Og of Bashan, whose bed measured 13 feet or 3.9 meters in length. See Deuteronomy 2:11, 20–22; 3:11–13 and Joshua 12:4; 13:13. I want to say at this point that God had given strict instructions to His people to completely eradicate all of the enemy that included men, women, children and livestock and for good reason. It was to prevent contamination and cross infection. Saul for example disobeyed that instruction and you know the outcome. God could have healed my tooth and I prayed that way, but it was not to be so. It had to be removed, to prevent other problems and this is the central core of this message. Fix what has to be fixed up before it becomes too big a problem to handle later. Goliath was confronting God’s people when David arrived and prevailed against him, but it is only part of the overall picture. David wanted to know, “What’s in it for me?” and it is perfectly OK to ask what we have inherited. We need to know all the facts, like who we are, what Jesus did, what we can do and so on. We need to determine our boundaries, recognize and understand our position in Christ and more importantly...to exercise our rights in and through Him. God has given us the land, but there are giants there who we must dispossess to take possession of our inheritances. There is a story of a man who went on a cruise ship. He booked into his cabin and was looking forward to reaching his destination. Day after day, the ship sailed closer to port whilst the passengers enjoyed themselves. The man made himself at home in his cabin and carefully meted out the provisions he took with him ensuring that he had enough to reach the destination. On arrival as he was disembarking, the steward asked him why he had never come to the dining room for meals. The passenger said that he had saved for the trip, but did not have enough for meals, litle realizing that they were free! They had been included in the price of his fare. Whatever we need for our own journey is free and already paid for. I have observed over the years however that many Christians are not aware of this as they live far below the standard, or the mark God set for us in His Son. This not only includes partaking of the benefit and privileges, or the blessing, but walking in the victory Jesus already won.We know that Jesus destroyed the works of the devil and won the victory for us. Of that there is no debate, but although the ultimate execution of sentencing is yet to be fulfilled, he is still wandering around seeking to take us down with him. Never be afraid of him and do not underestimate him, but always ensure that you are wearing the armor of God at all times, knowing that we can and should walk in the victory. Our armor is not provided to simply look good or defend us as we hide behind it. Our armor is mighty through God to the tearing down of enemy strongholds. The Armor of God is discussed on my web site. Click here. Our armor is a weapon against which no enemy can prevail, but we need to know what it is and what we can do with it. Often times winning the battle requires us to deal with intellectual arguments and debates, theories and pure pride. We win by bringing every thought captive and bringing it into submission...to Jesus. See Philippians 2:5, 4:6-9 and James 1:13-16. ...And now, dear brothers and sisters, one final thing. Fix your thoughts on what is true, and honorable, and right, and pure, and lovely, and admirable. Think about things that are excellent and worthy of praise. Since I was saved in September 1968, I have seen and witnessed some stuff, some of which was pure demonic, but I do not engage in “spiritual warfare” as some do. If and when occasion dictates, we are to take authority of course, but on most occasions, I would say that most problems you and I experience are in the areas of the mind. OK, that’s dealt with. Back to David. By his own admission, there was a righteous cause and if no one else was going to do something about it, he would and weighed up the pros and cons. That’s a good place to start any endeavor. Jesus told us to do that. He said that no one starts a building project unless he first determines the cost and if it is feasible. David saw the enemy and weighed up the cost and the possibilities, drawing off his knowledge of the word of God and what God had done for His people and from his own testimony. Having such knowledge is champion building material. No one can argue with good experience or a testimony of the reality and truthfulness of God and His word. The Lessons we can learn from this story are many and varied but I will only touch on several. Saul tried to get David to wear his armor, but thankfully he refused to wear it. God has given each of us individual talents and abilities and functions in life. What He has asked you to do could be vastly different to what He wants someone else to do, so avail yourself of those things and only do those things; nothing else. This applies to pastors as well as all believers. If you step out from your personal calling, you will be trying to work under a barred anointing and risk not only your own failure, but cause hurt to others in the process. David selected five stones from the brook. This was a deliberate and planned act. He was working to a plan. Many believers fail in their endeavors because they do not make plans. They are keen and enthusiastic and could have a legitimate call on their life, but do not prepare themselves to fulfill it. Bible colleges do not always fully equip people for the real ministry God has, but tend to shape the student into their own mould, often denominationally based. That’s OK and it does give credibility and does impart certain good and necessary information, but not necessarily equipping them God’s way. Selecting 5 stones (5 is the number for God’s grace) took some time and effort. We see in 1 Samuel 17:40 that he chose smooth stones from the brook, meaning that he searched for the right tools for the task ahead. I have heard it said that he did this thinking that if he missed Goliath with the first stone, he would have a backup. That is wrong! There were other giants to conquer and I shall elaborate later and he was ready for all of them. Goliath was first. David hasted and ran towards his enemy. The meanings of haste and run are different. Haste is māhar that I believe means in this instance that he did not waste any time, but immediately went into action. The opportunity presented itself and he took it. The other word is rûṣ that does indeed describe the act of running. What it all means, I believe, is that he saw an opportunity, did his homework and then immediately got into action and meant business. He did not want to miss the day of his visitation as many believers do for a myriad of reasons. We are in a race after all and are told to run it. He fitted one stone into his sling as he ran towards the enemy after making his faith declaration—that he was coming in the Name of the Lord and what he would do. He deliberately aimed at Goliath’s head. It was no hit and miss effort, or, “Let’s try it and see if it works”. The meaning to us, especially to those in ministry is, as I said earlier, to work in your own calling and focus on that. If God called you, He anointed you for that task and if He called you, He provides for you. I’ve seen too many lovely people and churches go down because they attempted doing something God never ordained, or not laying full and proper foundations. Financial issues and power struggles are prevalent. I know of several churches that were going great and growing well until they had a building program. They got into debt, people were hurt and the public witnessed it. David faced more than one opponent. We tend to think that this was about one man of God and Goliath, but David faced 5 other obstacles, making 6 in all. That word device is interesting, coming from the Greek word noēma that talks about perception, purpose, intellect, mind and thought. I mentioned earlier that in order to succeed, we have to ensure our thought processes are right. We can be distracted by all kinds of things, some of which are good and wonderful, or as Paul said, “Lawful, but not expedient”. Regardless of what it is, even if it is a good thing, we cannot afford the luxury of letting our guard down and allowing something else to take our gaze off the things God has for us. Whilst we are looking at that shield, the giants we face could be taking aim and about to launch a barrage at us. We then wonder, “What happened?” What went wrong? Why did that person betray me?” and so on. Sometimes such attacks do not come from the outside, or the heathen, but from a brother or sister in the Lord or a relative! It happens! ​David cut Goliath’s head off. He knew that he had slain his enemy, but wanted to make sure that the source or the driving force behind him was eliminated—and everyone knew it! It is quite possible that we have a situation or a problem and deal with that little realizing that the real culprit is hidden or that it has companions. Goliath was not the only giant that David faced and I have already mentioned the armour bearer. He faced 6 enemies. Second Samuel 21:15–22 and 1 Chronicles 20:4–8 tell us that there were four other unusually tall warriors among the Philistines. They were Saph (also called Sippai), Lahmi, Ishbibenob, and an unnamed warrior. They are described in similar terms to Goliath , being described as great in stature. The immense dimensions of their weaponry are also listed. Giants like the Anakim were mentioned earlier. The Israelites also encountered tall people known as Emim in Deuteronomy 2:10–11 and the Zamzummim, also called the Zuzim in Deuteronomy 2:20. The Amorites, also mentioned previously also confronted God’s people. If we put these things into present day context, they represent sin in its various manifestations and especially those that have not been dealt with, that will continually try to rise up against us with the purpose of preventing us from taking hold of our inheritance. At this point, we would do well to briefly touch on some aspects in a brief overview. The Israelites (and others) had a simple approach to names and places and called people by an obvious trait. Even though a people in a city may have had different family names, their city was named after their reputation. For example, if it was a big city, its name might simply be Big City. If all the people in one city had a reputation for horsemanship, the city might be called Horse City. The nations that Israel had to defeat to subdue the Promised Land bore significant names and they are all members of that “ite family” I mentioned, each having their own particular characteristics, that have to be handled according to their individual characteristic. According to that passage in Exodus they had to do it in progressive stages and not all at once. So do we. The name Canaanite for example means merchants who humiliate. This spirit is very powerful and active today and the financial structure of the world system is influenced by this spirit. Canaanites are motivated by greed and the lust for material accumulation, including manipulation and control over finances. The name for Hittites means terror. Hittites were giants who brought fear, confusion and discouragement. The believer today can be challenged by the enemy’s bombardment of fear, confusion and discouragement. Hivites claimed to offer a good life by living their lifestyle. Many alternate philosophies and religions today offer to give their adherents “life”. The enemy loves to lure people into lifestyles claiming to be the answer to that person’s needs and desires. Lifestyles such as “swinging”, “if it feels good-do it”, “don’t worry what other people think”, “look out for number one” and “its about time you did something just for yourself” can all lure people away from the lifestyle that God requires of them. I suspect that the excesses of the “grace movement” may be influenced by this spirit. The Perizzite spirit likes to get people to live in separatism, or in unwalled cities or villages. The aim is to separate us from each other and from God, thus leaving us exposed and vulnerable. Something that I believe is common in the church is the Girgashite spirit. Girgashites are earthy people who like to go back and revert to carnality. The aim is to cause backsliding. It does not happen quickly, but little by little, mostly by little compromises here and little compromises there. The implication for a believer is that he or she must do battle and control bad habits and slackness and the like. This spirit is rife in the church. Amorites were people who were arrogant and boastful in their speech and always challenged authority and positive faith filled speech. Our main battle in this area is with our tongue. The last Giant I will describe is the Jebusite. They were people who trod on others and polluted them. They major on power and defilement. There are two areas in which we can be defiled; sexually (Genesis 34:5) and religiously (Leviticus 18:30; 20:3 and Nehemiah 13:29). The Jebusite spirit seeks to destroy the believer in these two areas. Obviously I have only but touched on some of these giants, but they are there and we have to adopt the same approach that David had. Goliath was the first. After slaying him, David was ready to go for all the others. Allow me to bring this to some kind of practical conclusion and to do that I will talk again of my dental issue. I was totally unaware I had a problem until it revealed itself! Sometimes we can live as if there are no problems, or if we are aware of them, choose to ignore them, hoping they all go away. We might get away with it for a while, but are only postponing the inevitable. Remember that old saying, “Your sin will find you out”? See Galatians 6, especially verses 7-10. 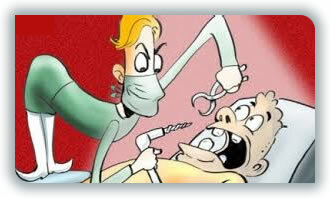 When I visited the dentist, he said that he would refer to refer me to a specialist which he did. I received a letter from the specialist advising of the date and time of my appointment and approximately 6 weeks after my initial consultation, that tooth came out. It could not be extracted in the normal way, so surgery was required. Radical action was needed. During that waiting period, all symptoms had disappeared. I had no pain and there was no swelling, so it would have been easy to forget everything and not take any further action. I had laid my hands on myself claiming healing, but the Lord had sent me to a dentist. Sometimes we disregard the Lord’s advice to our peril, as ignoring that would have been disastrous for me, because at some future time, the problem would have re-emerged, possibly worse than before. One tooth can affect your sinuses, your ears and goodness know what else. It is like having one rotten apple or a potato in the barrel with all the good ones. The lesson to be learned for us as believers is to deal with issues as soon as they arise and not to open ourselves up to anything that would cause spiritual tooth decay. If we find a problem...fix it. Don’t delay. That is procrastination and you know what that is. It is putting something off til tomorrow that you have already put off from yesterday. I do not need to elaborate. God has a plan for our lives and He has a Promised Land for each and every one of us. The promise is there and God keeps His word, but on our journey, we will have opportunity to fail; to face opposition; to be tested, to get discouraged and to face our own personal giants in the land. Don’t just settle for a partial victory, because it could be only temporary, but make sure that you deal with all issues. If necessary rid yourself of that rotten apple or potato and sometimes this means severing relationships with certain people! Your Goliath could have 4 brothers waiting in the background for their turn. God had commanded the Israelites to totally eradicate all the enemy and deal with the issue, but they did not. Saul for example was commanded to root out and destroy all the enemy and everything associated with him, but he did not. The root that remained eventually rose up against the nation to destroy God’s people and Esther came to the rescue. How to do it is the issue and David showed us how. He acted responsibly, fulfilled his duties faithfully and arrived on the scene when everyone else needed a champion. There was a cause and when a cause arises, a champion is needed. He had a testimony. You have a testimony. He knew what reward he would have. We already know the reward ahead of us when we are out of here. Actually, we do not really have to wait for all our rewards because many are already in store for us in the here and now. He knew what God had already done. You too know what God has already done. It is recorded in the bible. He refused to use any natural weapons but relied on what God had provided him. We can do that also. We have God’s word and the Holy Spirit is here to help and equip us. He told the enemy what he was going to do. That was making a faith confession. We too can make our own faith confessions based on God’s word. He carefully chose his 5 stones that were smooth, after having been washed in the brook that we can liken to the washing of water by the word. Stones are smoothed by regular tumbling by water movement, implying that we need use the word regularly. I hope that you got something out of this and that it was informative, challenging and inspirational.